Democrat Beto O'Rourke abandoned his usual message of unity and optimism on Tuesday and laid into Sen. Ted Cruz (R-TX), hoping to reverse polls that show him fading against the Republican incumbent during the second debate of a Texas Senate race that's become one of the nation's most closely watched. 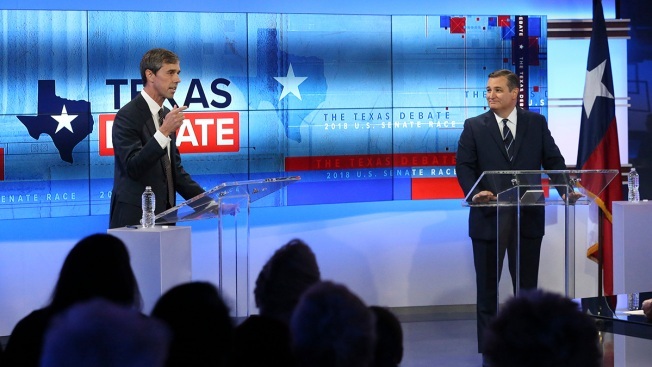 During the opening moments, Cruz criticized U.S. Rep. O'Rourke (D-El Paso) for past votes supporting a never-enacted oil production tax that might have hit oil-rich Texas hard. O'Rourke responded by evoking a moniker Donald Trump bestowed on Cruz when the pair were bitter rivals during the 2016 Republican presidential primary, saying, "Senator Cruz is not going to be honest with you" and "it's why the president called him Lyin' Ted and its why the nickname stuck." Democrats have long dreamed about a growing Hispanic population helping to flip Texas from red to blue and shaking up the electoral map. But polls that once showed O'Rourke within striking distance of a monumental upset now suggest Cruz may be edging further ahead. No Democrat has won any of Texas' nearly 30 statewide offices since 1994, the nation's longest political losing streak. Cruz kept O'Rourke on the defensive when they debated last month in Dallas, and O'Rourke -- who had stuck to a bipartisan, feel-good message for months -- kept a promise to sharpen his tone during Tuesday night's faceoff in front of a live audience of 120 people split between supporters of each candidate and hosted by KENS-5, the CBS affiliate. With Election Day just three weeks away, Tuesday night could be one of O'Rourke's last shots to gain ground -- this is the race's last scheduled debate after one in Houston was canceled amid Senate floor votes on Kavanaugh's confirmation. Cruz wants to participate in a previously scheduled townhall featuring just O'Rourke in the U.S.-Mexico border city of McAllen on Thursday night, but it's unclear if that will come together in time. Trump, who won Texas by nine points in 2016, is taking the once unthinkable step of staging a rally in a state that's so reliably conservative, heading Monday to an 8,000-seat Houston arena. Cruz has been a full-throated supporter of the president he battled during the presidential race two years ago, and hopes that the joint appearance will assuage some conservatives around the state who were angered by the past animosity.